The winner is Ali @ LastSplash!! I'll be emailing you to get your info and pass it on to Jen so she can contact you! 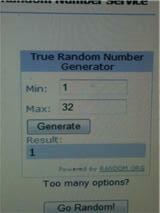 Thank you all so much for entering. I'm planning on another giveaway soon, and I hope to do more in the future, so I hope you'll keep reading! And don't forget to tell all your friends about VeeveCosmetics! !